In regards to Fowler Avenue, the route was in bad shape but honestly is probably something I never would have thought would have gotten SB1 funds to fix it. 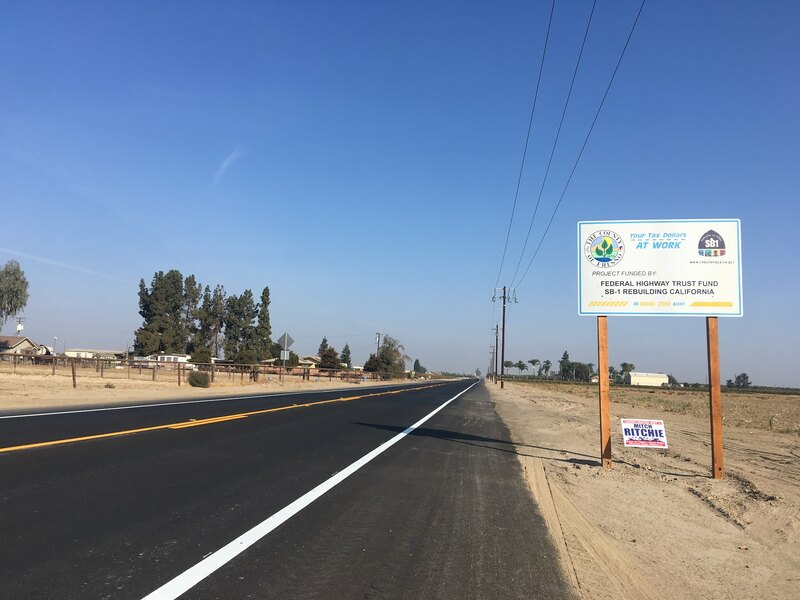 I'd probably say at least to as far south as Elkhorn Avenue the new surface probably meets or exceeds the quality of CA 43 which is the favored route from Fresno to Hanford for most traffic. Probably the biggest project I've encountered this past year in my area was the repaving of CA 41 north of Oakhurst. It looks like 198 is getting some huge upgrades as well west of Coalinga, what projects is everyone else seeing in their areas? Any chance of acquiring (& posting) maps that break down these projects by county -- or at least by Caltrans district? Might be able to narrow down some of the planned projects, particularly in urban areas. I-5 between Hood-Franklin (the future connection to Kammerer/Capital Southeast Corridor) and I-80 is one of two Sacramento area freeway corridors marked on the map, as is US 50 along the WX Freeway and then between Business 80 and Route 16. That 85/87 continuum in South San Jose may well be related to the VTA LR line in the median (which does access the 87 median a few yards north of the I-280 interchange) rather than the freeways themselves. I'll know soon enough (that is, if Prop 6 fails! ); I'm on 87 at least three times a week, and will encounter any construction efforts in person. Anyone want to make any predictions about prop 6? I am voting against and feel it might be defeated at times, but my prediction is that it passes. I'm voting against it. I just moved to Palm Springs from St Louis, and I've seen first hand how underfunding roads leads to crap highways in Missouri. I'm voting no on Prop 6. Rolling back the gas tax by $0.12 a gallon won't make that much of an impact on gas prices, but the loss of revenue will cause the deferred maintenance backlog to grow out of control. The federal government is cutting back and is expecting the states to do more in terms of matching funds. The states will have to increasingly provide their own funding, which is exactly what SB1 did. I'm against it. You'll see my more detailed thoughts if you read my next highway headline post, which will go up either later today or tomorrow morning. The tax increase was regressive. I would have supported an increase in the gasoline and diesel taxes to index them for inflation if they had repealed the imposition of sales tax on the sales of gasoline and diesel fuel. In other words, what SB1 did was adjust what we had been doing for inflation. The excise tax is one of those few areas where those using the service (roads) are paying for the service. Those who use it more, pay more. And the sighs of relief can be felt statewide -- and certainly up here in San Jose. Trying to use the bullet train as a diversionary tactic didn't fool enough folks to shift the results; the campaign to tie the measure to crumbling bridges was masterful and, in the final measure, effective. Now we'll see how the funds will be distributed now that the "heat is off", so to speak. I am so glad I was wrong! Great day for California’s infrastructure. Really had it passed there likely would have been some sort of other legislation introduced to repair the roadways. The thing that had me concerned was that it would be the "usage tax" that was floated around two years. Interestingly enough, Caltrans' Monday advertisement immediately before the election was very large--files aggregating 4.36 GB, with sizable projects in Districts 3, 4, 5, 6, 8, and 12. Where do I go to get those? Projects are typically advertised every Monday, or on Tuesday if Monday falls on a holiday. The volume of advertisements has been pretty high since SB 1 money started coming onstream, but this Monday's was quite large even in comparison to the new normal. Thank you for the information. I will be looking over these routinely most likely. It is nice to hear that contracts are increasing. I can only think that we haven’t hit the maximum funding yet. By its very definition, it’s regressive. Poorer people tend to be less able to afford fuel efficient vehicles, particularly hybrids. Notwithstanding “cash for clunkers” taking some used car stock off the market, buyers in the used car (i.e., less fuel efficient car) market tend to be dominated by the lower quartile of earners. Imposing what is effectively a 10 to 15 percent increase on fuel costs for the poorest Californians is incontrovertibly regressive. Further, most of your independent trucking operators and captive “independent contractor” rig operators are in the lowest quartile of earners. As a labor attorney, I see all the time how these drivers are obligated to pay all of their costs (often in violation of state law and the wage orders) which includes diesel fuel costs. The diesel fuel increase is highly regressive. And before the tax increase, California already had among the highest fuel taxes in the nation. Claiming that the increase “catches up to inflation” ignores that these taxes were already skewed well above the norm for what the average American pays in fuel costs. Adding an additional cost burden to the lowest quartile of earners, including truck drivers, contractors, and blue collar workers, is unconscionable. The legislature should have been stopped from raiding the highway funds as a rainy day account. They weren’t, and Prop 6’s defeat is going to embolden further diversion of most of the preexisting highway fund as collateral for more bond obligations on projects completely unrelated to highway maintenance or expansion. I noticed a few of those signs on I-5 in the Redding/North Valley area while watching video of a Big Rig Steve trip from a couple of weeks ago, too. Yes, fuel taxes in general are regressive, but especially in California I think the fuel tax increase is among the least of the challenges faced by low-income drivers. The emissions inspection regime is rigorous and makes it extremely difficult to keep a car aged beyond 15 years on the road compared to, say, Kansas. It is in fact the main reason first-generation Saturn S-Series cars like my daily driver--which at 24 years old has a cash value probably under $1000 but is extremely reliable, not having had to have any repairs since an alternator replacement three years ago--are hard to find in California, yet extremely cheap when found: as they are scrapped for emissions issues they become rare, while the heavily discounted price for surviving examples reflect the steep compliance costs. Assuming 10,000 miles a year at 25 MPG, annual fuel consumption is about 400 gallons, so the added cost due to SB 1 fuel taxes is $40, which is quite small compared to the increased amortization cost of a newer used car that can be trusted to pass smog inspection without expensive repairs. Hybrids of whatever age are not really affordable to low-income drivers anyway, because of the higher initial purchase cost, the flatter depreciation curve, and the liability for battery replacement. Realistically, a low-income driver is budgeting for between 25 to 30 MPG in a gas-powered compact car and rolling in a gamble on extremely variable emissions compliance costs. 10c/gallon is also dwarfed by fluctuation in underlying fuel cost during the course of the year, let alone due to the underlying crude oil price. California is also an extremely expensive state in which to register a car (the DMV fee alone is about three times vehicle property tax on my Saturn in Sedgwick County, Kansas), and to insure it (the uninsured motorist percentage is sky-high, especially in greater Los Angeles). These abuses are why we have in the past had robust private-sector unions and, for a time in the trucking industry, a master freight agreement. Actual enforcement of the legal protections for labor that still exist would be a start; underfunding the infrastructure doesn't really solve the problem. California also has a high cost basis and a tremendous backlog of needed capital investment. My understanding is that a proposition passed in the mid-noughties requires all fuel taxes (if not all transportation-related revenues such as mass transit farebox receipts) to be dedicated to transportation. This, of course, does not prevent the gas tax being used exclusively to fund urban mass transit. I also do not know whether it is constitutionally or statutorily permissible to divert revenues to meet short-term budget contingencies on the strength of a non-enforceable promise of repayment. It is beyond question that there are excellent policy arguments for enforceable limits (if not an outright ban) on diversions and also for some kind of limit on revenue transfer from one mode to another. But there are real infrastructure needs that should be funded one way or another. You mean projects that help poor people get around without an expensive car. If you lived in LA, you’d know that a very very small percentage of people get around without a car. Mass transit projects serve very limited areas due to the vast size of Greater Los Angeles and the many different areas where industrial, commercial, and white collar jobs are located. For example, just the City of LA itself has about twenty distinct job centers where commuters travel to and from. There’s no affordable mass transit system that can address that. When the freeway system was being rolled out in the fifties, they thought they could address lower income commuters with busses that utilized both the freeways and the arterials. The service was so poor (mainly because there are just too many miles to cover) that this led to the infamous “bus riders’ union to lobby for the right of bus users to better bus service. They eventually got pushed aside as light rail, the subway, and regional commuter rail were deemed more politically important. A former colleague of mine who took a job in Downtown LA decided to start using the regional rail network to commute to his job from his home in an exurb 25 miles away. He gave up because (1) it wasn’t any faster than driving, (2) the timing of the service was inconvenient, (3) the service was inconsistent, and (4) it was often uncomfortable. Like him, I took the same regional rail from the same station 10 years ago when I worked in LA and also eventually gave it up for driving because it wasn’t saving any time. And when I took it back then, the trains were at least comfortable and there was room to sit and use a laptop or read a book. Today, he complains that by the time he boards the train, it’s standing room only. And what is supposed to be a 35 minute ride often goes to to 45 or 50 minutes because the commuter train uses the freight rail line and has secondary priority, so commuter trains are often slowed or stopped completely to give way to freight trains. I’m not poor, but if I tried to take busses and mass transit to my job 30 miles away in Southern LA County, it would take two to two-and-a-half hours. It would involve taking one bus to a regional transportation center, taking a second bus to a light rail station, and two light rail transfers. That’s compared to 40 minutes to an hour driving depending on traffic. And because of my commute pattern, even though it’s from a recognized suburb to a recognized jobs center (Long Beach), they’ll never build a direct light rail line between the two locations because it would never be financially feasible. My gardener can’t use mass transit. He has a truck and trailer he hauls around with his gardening equipment. My housecleaner can’t use mass transit. He has a car to carry his cleaning equipment and supplies. My kids’ babysitter can’t use mass transit. She babysits for many families spread out over a 10-to-15 mile radius. She needs a car to do that. The overwhelming majority of poor people in California don’t and can’t use mass transit. They want and need cars, including the clunkers J N Winkler pointed out are difficult to keep on the road here due to emissions regulations and other issues. That poor people need a car to get around, and have no reliable mass transit alternative is true in the LA Basin, the Inland Empire, San Diego, Sacramento, Fresno, the South Bay, the High Desert, the Antelope Valley, the Coachella Valley, and the San Fernando Valley. About the only place there is sufficient density to make mass transit a viable alternative are parts of the Peninsula and San Francisco itself. A couple of points: California has some of the most employee-protective labor laws in the country. Those state laws and regs are much more protective than the federal FLSA, and they have bargaining protections that are more protective than the NLRA, which is no easy feat. That said, finding “independent” short haul truck drivers is easy due to the glut of semi-skilled workers who can be qualified for the requisite license, and this perpetual glut has doomed any chance of creating a strong truck drivers union that would protect workers from having to bear costs that state law says normally have to be covered by employers. Third, you’re right about the proposition that attempted to restrict use of the state highway fund. But it included an emergency provision that allows the legislature to declare a budget emergency and raid the highway fund to “borrow” money for general funde expenditures. This has been used in years to balance the state budget with the state stacking up long-term repayment IOU’s to the highway fund. In fact, part of the recent fuel tax increase that was upheld with Prop 6’s defeat includes part of the tax revenue from the increase being used to help the state on repaying its IOU obligations for the original highway fund money borrowed. In other words, the state had an existing fuel excise tax, it borrowed money from its revenue to fund non-transportation expenses. It incurred a bunch of “loans” it had to repay, so it passed another tax, part of which is used directly for highway projects (deferred because the original excise tax revenues that would have paid for them were loaned out), and part of which is used to repay loans of the original excise tax revenues. The best part is that proponents can tout that most of revenues from the new tax “are going to road projects,” even though an uncritical public doesn’t know that this means they are going to repay money that should have gone to road projects in the first instance. If you lived in LA, you’d know that a very very small percentage of people get around without a car. Amusingly enough, these people tend to be in the upper-income brackets since they can afford to live in the exorbitantly expensive areas close to job centers. They can get literally everything delivered to their doorstep as well.